A Non-Disclosure Agreement (NDA) is a document that people in a business relationship use when there is the potential for confidential information to be shared. An NDA works by offering documentation that confidential information was disclosed to an individual with the expectation that the information would not be shared with anyone who is not entitled to it. What can I use a Non-Disclosure Agreement for? Employment: When disclosing business, client, or trade information to an employee or a consultant. Business Deals: When purchasing or selling a business, information relating to employees, trade secrets, clients, and other information pertaining to it (such as profits and losses) is disclosed to a buyer or seller. Inventions: When inventions such as products, recipes, or designs are communicated as part of a professional relationship. Non-Disclosure Agreements can also be used to protect other types of information between parties as well. Customer Information: Customer names and contact information, as well as a brief description of products and/or services purchased, leased, licensed, or received from an individual or business. Intellectual Property (including computer technology): Any information related to creating and selling a product or service, such as copyrights, patents, and trade secrets. Marketing, Product, and Service Information: Information on marketing or development of the product or service, like production processes, research, pricing and billing policies, and marketing techniques like advertising. Business Operations and Accounting Information: Names and contact information for the employees and employer, purchasing and internal cost information, and any information related to payroll and other financial reports. What is included in a Non-Disclosure Agreement? Employment Contract: An Employment Contract sets out the rights, responsibilities, and expectations of an employment relationship. Purchase of Business Agreement: A Purchase of Business Agreement outlines the terms for the sale or purchase of a business. Consulting Agreement: A Consulting Agreement sets out the terms of a given service between a consultant and a client. Letter of Intent: A Letter of Intent provides a framework for negotiations leading to a future binding agreement. 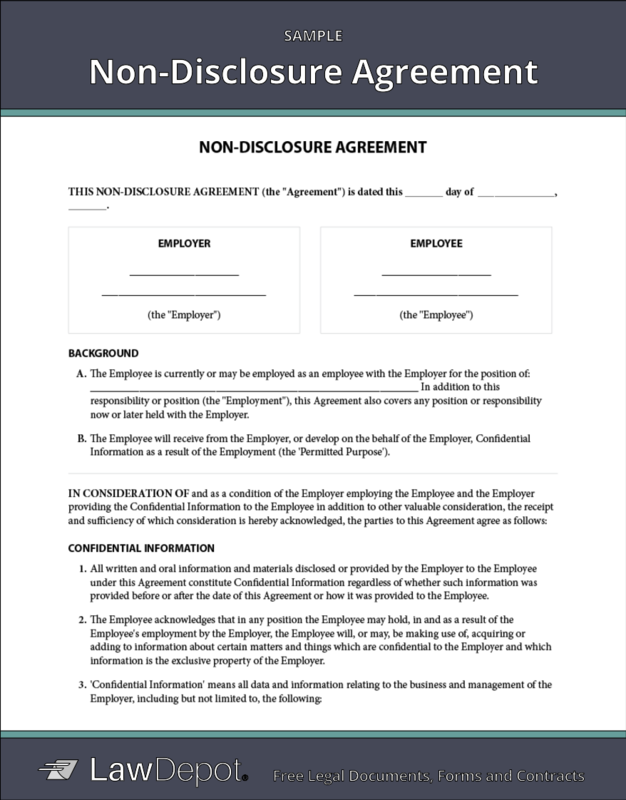 Personalize your Non-Disclosure Agreement template.